Fluorescence imaging utilizes light produced by fluorescent species that are introduced into the specimen of interest. The near-infrared (NIR) region offers advantages for photon penetration using exogenous contrast agents. Near-infrared optical imaging technologies are based on the light producing capabilities of extrinsic fluorescent molecules such as fluorescent proteins or fluorescent dyes. NIR imaging helps to overcome some of the shortcomings of imaging with conventional dyes which have limitations due to their shorter excitation wavelengths. It is known that the penetration of light through tissue is indirectly proportional to the fourth power of the wavelength used, and as such NIR light has the capability to penetrate tissue more efficiently than light in the visible range. Also there is less background fluorescence in the NIR region. Seta Dye NIR fluorescent labeling reagents provide a flexible solution for labeling proteins, peptides or antibodies. Available as 680 nm, 700 nm, 750 nm and 780 excitable dyes, these Seta Dye labeling reagents are ideal for in vivo optical imaging and fully compatible with the KODAK In-Vivo Multispectral Imaging System FX, the IVIS Imaging System (Caliper LifeSciences) or the Odyssey Fc Imaging System (Li-COR). Seta-650-NHS is a brighter replacement (extinction coefficient is ~200,000 M–1cm–1, and the quantum yield of labeled antibodies are as high as 33% at a D/P ~ 1) for Cy5 or DyLight 650 producing intense red fluorescence emission. It is a highly photostable dye that is optimally excited with the 647 nm spectral line of the Krypton-Argon laser. Exc./Em. max for conjugates: 650/671 nm. 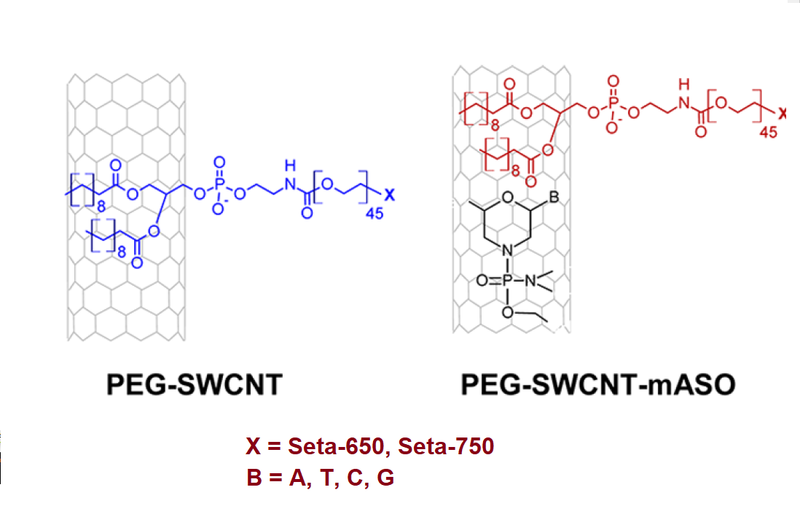 Seta-650 (K8-5035) and Seta-750 (K8-7035)-conjugated PEG-single walled carbon nanotubes (PEG-SWCNT-650 or PEG-SWCNT-750) were produced by labeling the PEG terminal amino groups on amino-modified PEG-SWCNTs with either Seta-650-NHS or Seta-750-NHS. 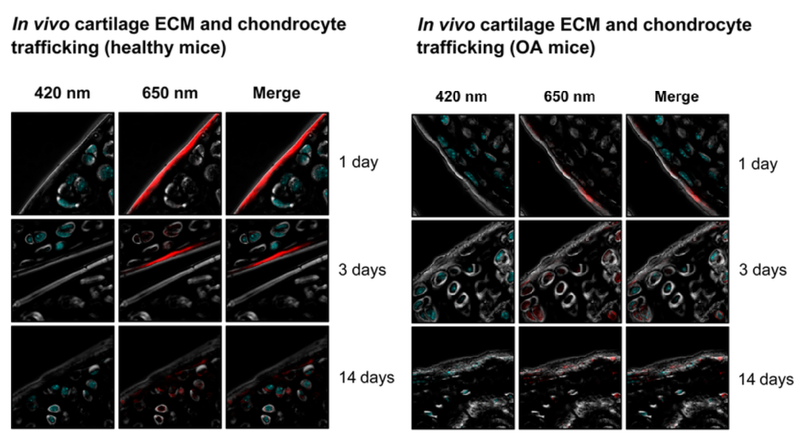 Cartilage ECM trafficking and chondrocyte internalization of injected PEG-SWCNTs: in Polyethylene-Glycol-Modified Single-Walled Carbon Nanotubes for Intra-Articular Delivery to Chondrocytes, M. Bottini et al. ACS Nano 8(12), 2014. Seta-680-NHS is an amine-reactive NIR fluorescent dye with absorption and emission at 680 and 700 nm. The dye is fully compatible with the IVIS Imaging System (Caliper) or Odyssey Fc Imaging System (Li-Cor). Its reactive dye content is optimized to be at least 75%. Seta-680-NHS and our other near IR dyes are ideal for in vivo imaging due to increased penetration of tissue in this long wavelength range. Seta-700-NHS is an amine-reactive NIR fluorescent dye with absorption and emission at 687/703 nm. It is efficiently excited at 680 nm and it shows high quantum yields up to 20% upon binding to antibodies or other proteins. Its reactive dye content is optimized to be at least >75%. Seta-700-NHS and our other near IR dyes are ideal for in vivo imaging. Seta-750-NHS is an amine-reactive NIR fluorescent dye with absorption and emission at 750 and 780 nm. It is bright and photostable. Its minimum reactive dye content is optimized to be at least 80%. Seta-750-NHS and our other NIR dyes are ideal for in vivo imaging due to increased penetration of excitation light through tissue in this long wavelength range. The dye is fully compatible with the IVIS Imaging System (Caliper) or the Odyssey Fc Imaging System (Li-COR). Comparison of in vivo biodistribution of PEG-SWCNT-Seta 750 in pregnant and non-pregnant animals. Recording of fluorescence shows an almost identical distribution pattern of PEG-SWCNT-750 in pregnant and non pregnant mice. L. Campagnolo et al., Particle and Fibre Toxicology 2013 10:21. DOI: 10.1186/1743-8977-10-21. Seta-780-NHS is an amine-reactive, NIR fluorescent dye with absorption and emission at 777 and 807 nm. Its reactive dye content is optimized to be at least 75%. Seta-780-NHS and our other NIR dyes are ideal for in vivo imaging due to increased penetration of excitation light through tissue in this long wavelength range. The dye is fully compatible with the IVIS Imaging System (Caliper) or the Odyssey Fc Imaging System (Li-COR). See also Fluorescence Imaging and Fluorescence Lifetime Imaging.